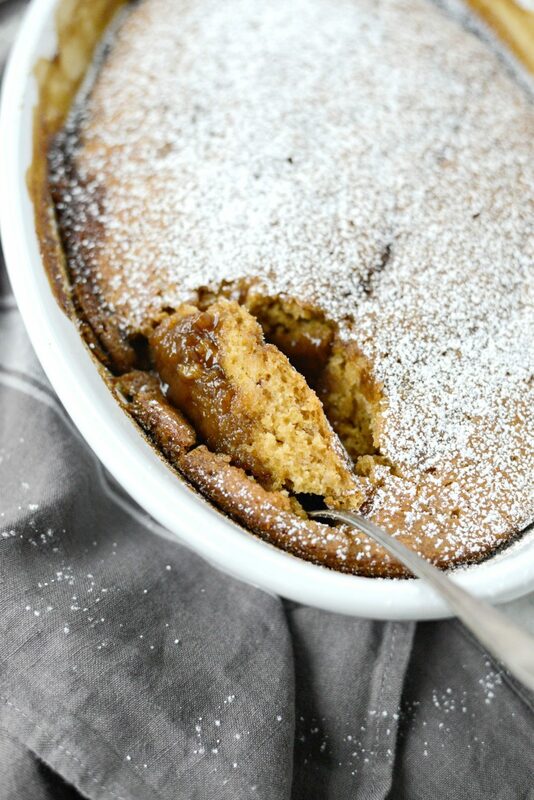 It’s officially baking season and first up is this warm and cozy Pumpkin Pudding Cake. 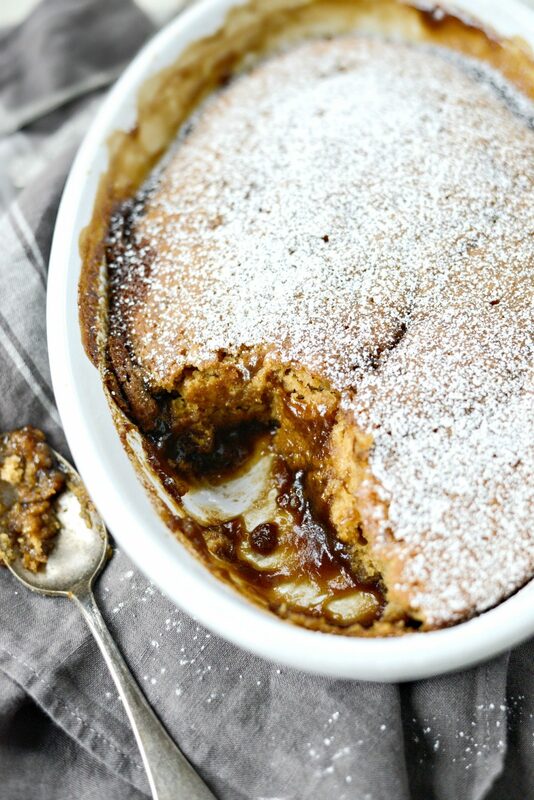 The super-moist and deliciously spiced pumpkin cake on top melts into a gooey brown sugar pumpkin pudding on the bottom. It’s basically magic. When I woke up this morning it was pouring rain. The kind of rain that makes you want to hind under the covers and nap all.day.long. The kind of rain that cleans off your dusty car and waters your mums [thank you Mother Nature]. I love this time of year because it’s so cozy! As much as I love sunny warm days, I equally love the hilly rainy days too. So far this fall, Michigan’s weather has been all over the place. One day it’s 90° and then it’s 60° and raining, but don’t worry because the next day it will be 72° and sunny! [sarcasm] Is it really too much to ask for typical fall weather? I can’t make a hearty pot of stew when it’s 72° out in October, let alone figure out what the heck I’m going to wear. However, yesterday was the “perfect fall day”. Rainy and cozy and filled with pumpkin cake. 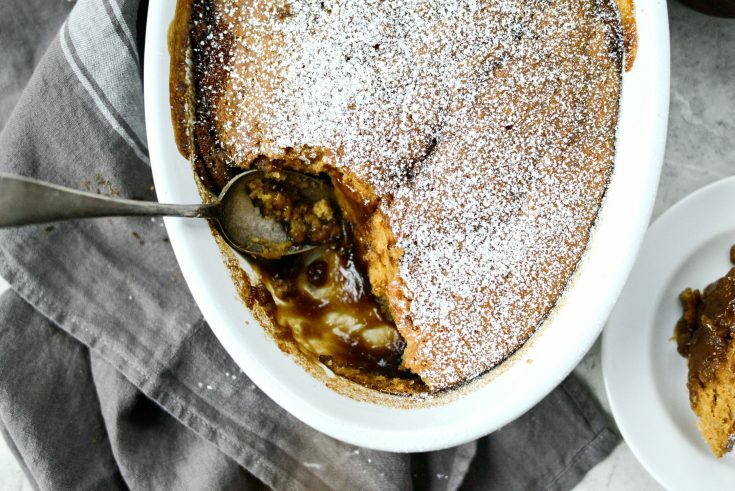 What’s more cozier than a warm ooey-gooey pumpkin pudding cake? While clicking through some old posts, I found this chocolate version and immediately wanted to try it with pumpkin, minus the chocolate. I had visions of a spiced pumpkin cake and a gooey, pumpkin-brown-sugary pudding below. After reconfiguring that old recipe, I think I nailed it. And if my 13-year-old and her 8th grade friends loved it, then I think it’s safe to say that this pumpkin pudding cake is a hit. 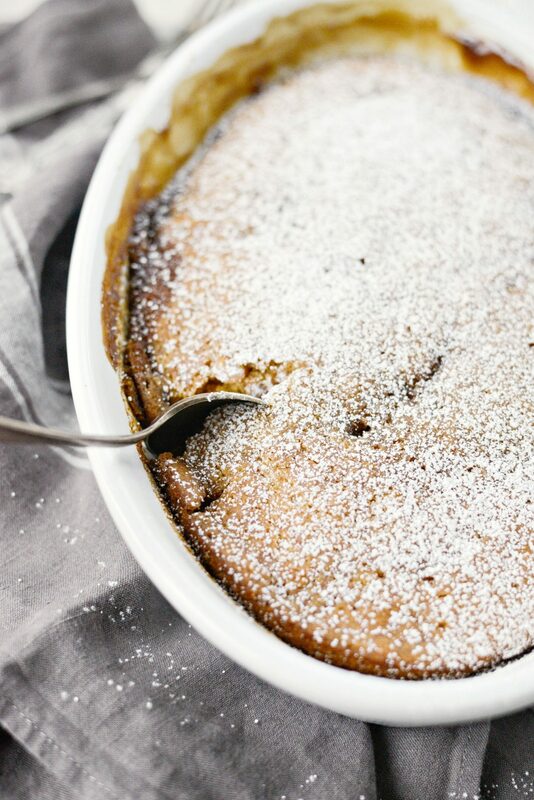 First place 1-1/2 cups of the all-purpose flour into a bowl with 3/4 cup granulated sugar, 2 teaspoons baking powder, 3/4 to 1 teaspoon ground cinnamon*, 1/2 teaspoon kosher salt and 1/2 teaspoon freshly grated nutmeg. Then just whisk to combine. *Please note that not all cinnamons are a like. In my experience, Ceylon cinnamon is a bit milder in flavor so I would use 1 teaspoon. Cassia cinnamon, 3/4 of a teaspoon. Next add in the wet ingredients; 1/2 cup pumpkin puree, 1/2 cup plus 2 tablespoons whole milk, 2 tablespoons melted butter or coconut oil and 1 teaspoon pure vanilla extract. 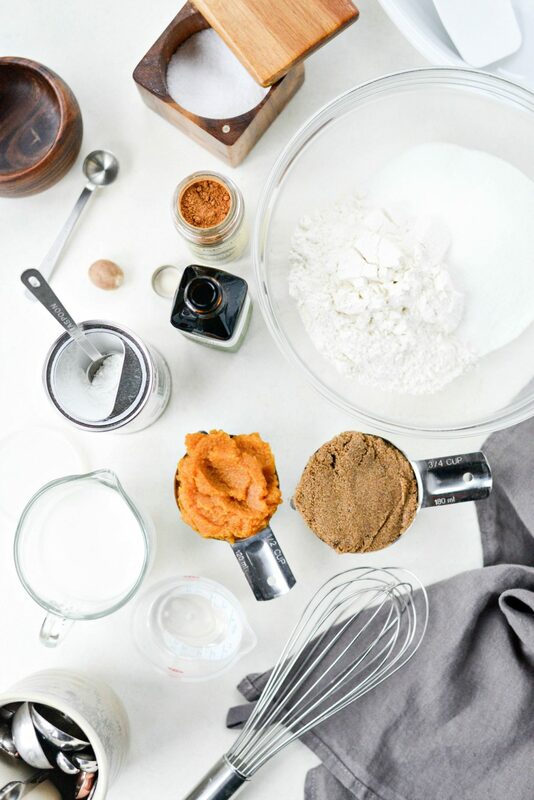 If using homemade pumpkin puree, you may only need to use 1/2 cup of the milk. 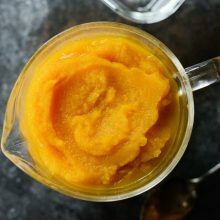 Homemade pumpkin puree is a little wetter and more loose than canned pumpkin. Mix just until the batter comes together. 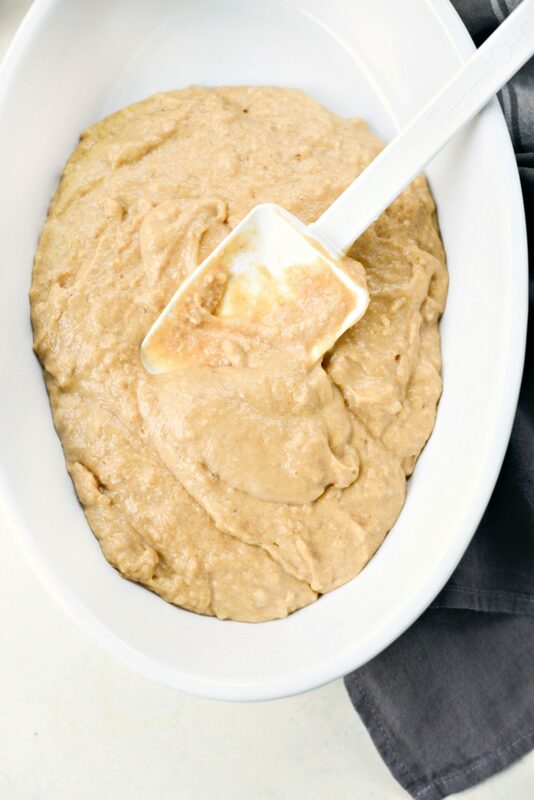 Then pour the pumpkin cake batter into a 3-1/2 quart baking dish and use the spatula to spread it evenly.. This last and final step is where the magic is. 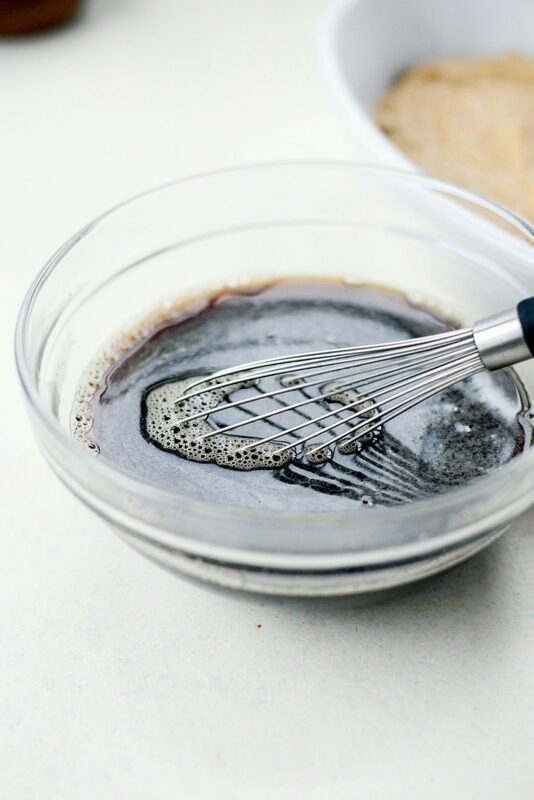 Simply whisk together 3/4 cup dark brown sugar with 1 cup hot water and then pour it directly over top of the cake. DO NOT STIR IT IN! 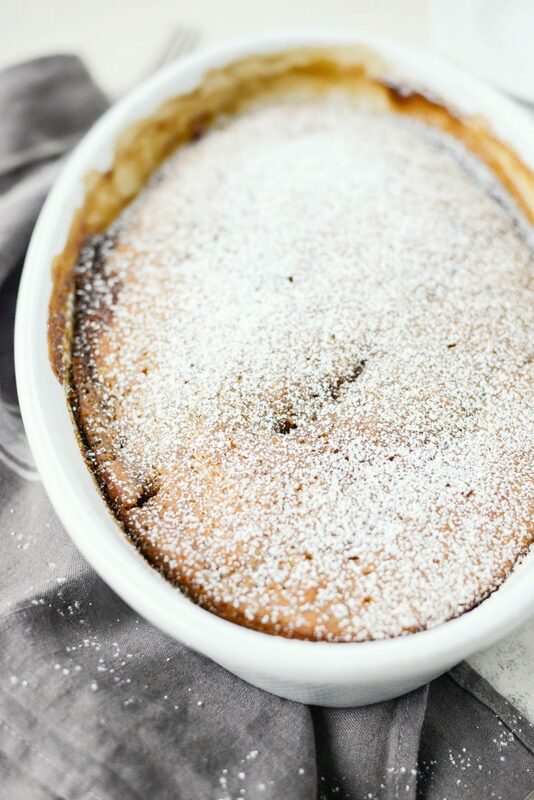 In my chocolate pudding cake, I sprinkle the brown sugar over top and pour hot coffee over the top. I found that by doing this, any undissolved brown sugar will lead to pockets of brown sugar in the cake. So this method works much better. Carefully slide the pan into your preheated 350° oven for 40 minutes, rotating the pan halfway through baking to ensure even baking. 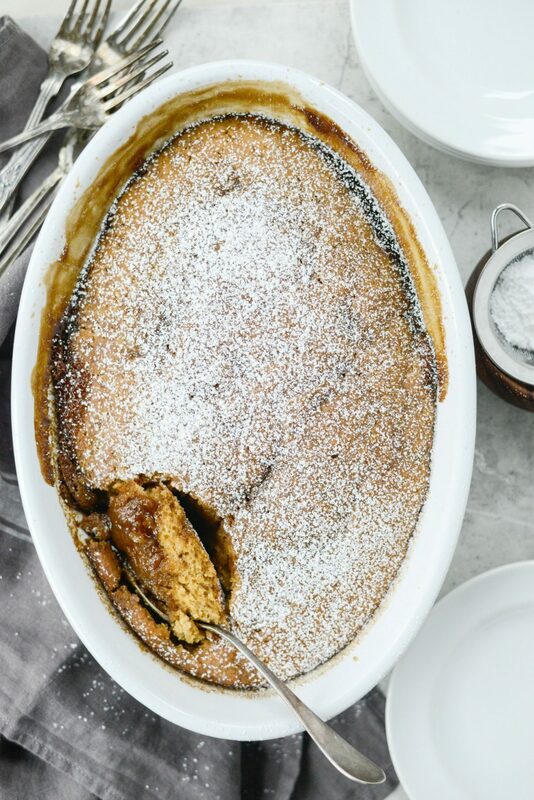 The brown sugar and pumpkin pudding below the moist spiced pumpkin cake is bubbling away and creeping up the sides. SO good. I let the pumpkin pudding cake cool for 5 to 10 minutes before dusting with powdered sugar and serving. My favorite, is the caramelized crispy edges. My girl love where the cake melts into warm pudding. Ether way, this cake is a win-win. Enjoy! 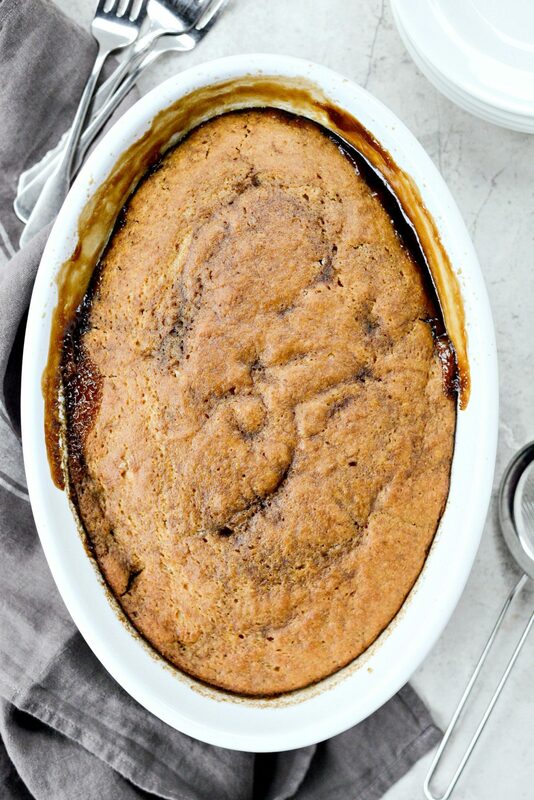 And if you give this Pumpkin Pudding Cake recipe a try, let me know! Snap a photo and tag me on twitter or instagram! 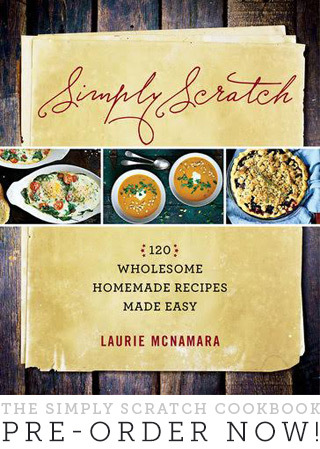 My cookbook Simply Scratch : 120 Wholesome Homemade Recipes Made Easy is now available! CLICK HERE for details and THANK YOU in advance! 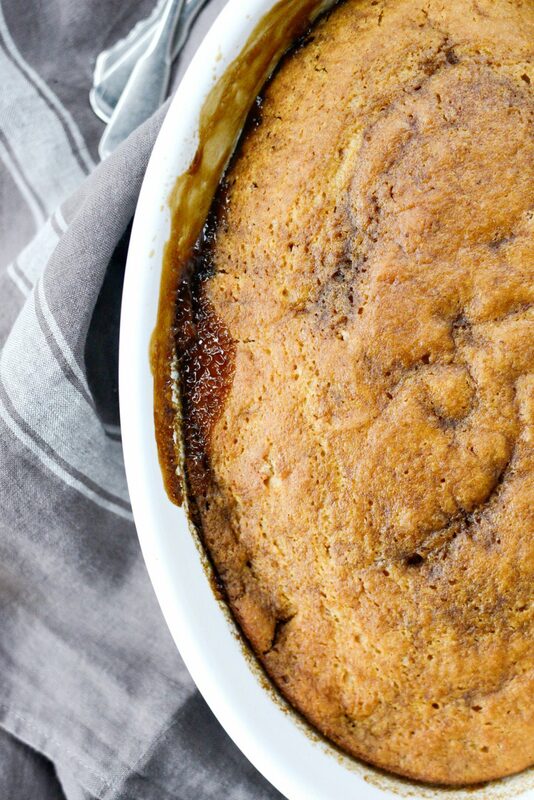 It's officially baking season and first up is this warm and cozy Pumpkin Pudding Cake. 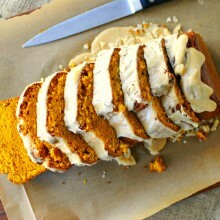 The super-moist and deliciously spiced pumpkin cake on top melts into a gooey brown sugar pumpkin pudding on the bottom. It's basically magic. Preheat your oven to 350°. 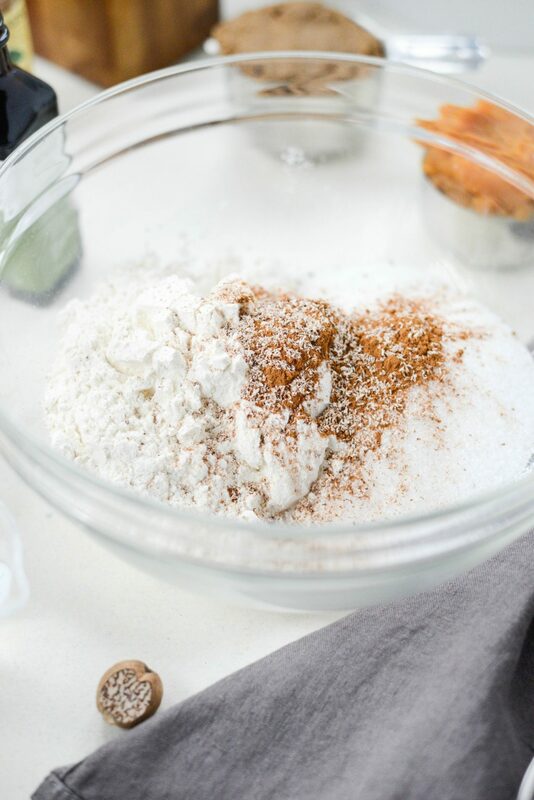 In a medium bowl whisk together the flour, granulated sugar, baking powder, salt, cinnamon and nutmeg. Next add in the pumpkin, milk, butter (or coconut oil) and vanilla. Use a rubber spatula to mix the ingredients until incorporated. 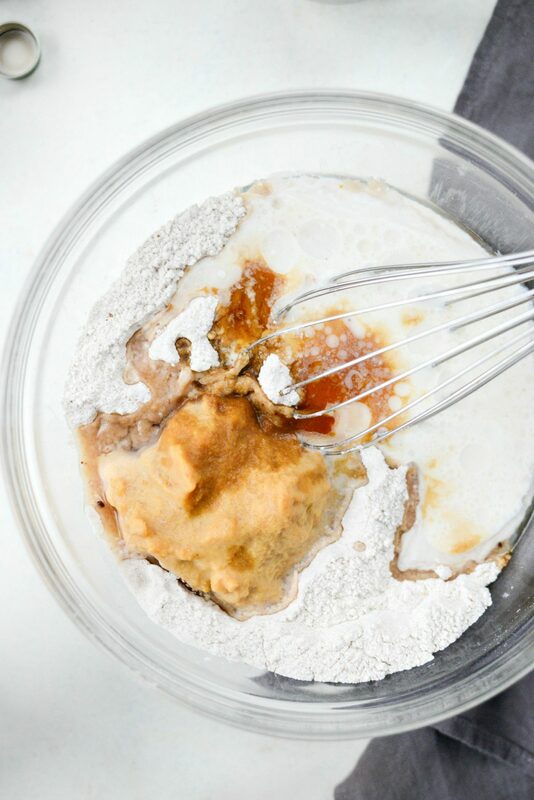 Pour the cake batter into your un-greased baking dish and spread out into an even layer. 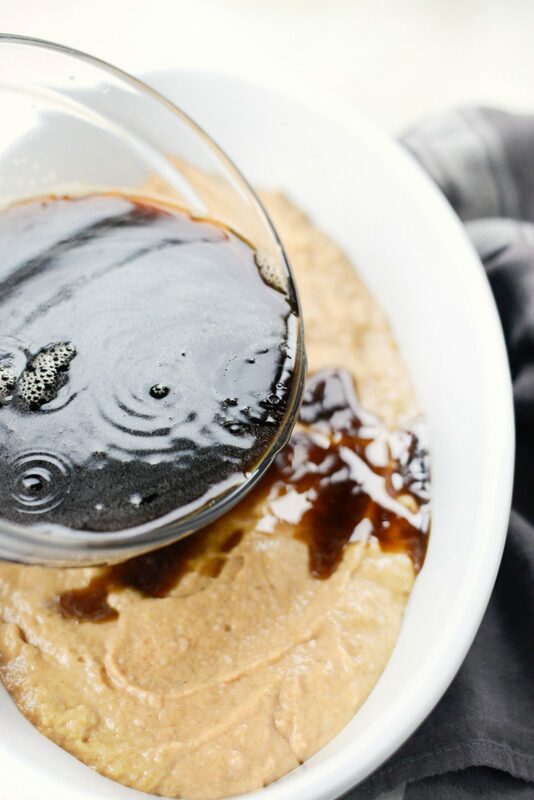 In a small bowl, whisk dark brown sugar with hot water. Then pour it over cake batter, DO NOT STIR. 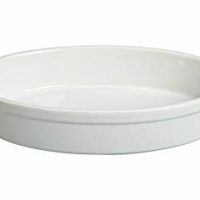 Slide the baking dish onto the middle rack of your preheated oven and bake for 40 minutes. Rotate the baking dish halfway to ensure even baking. 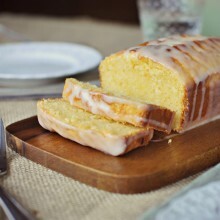 Allow the cake to cool for 5 to 10 minutes before dusting with powdered sugar and serving. YUMMIEST idea we’ve seen yet! You are very creative! 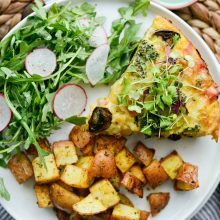 have you tried any GF flour subs for this recipe? thx! Hi Alison, unfortunately I have not. Sorry! This cake sounds very yummy. My daughters and I are lactose intolerant. We can tolerate small amounts of skim milk, but whole milk is definitely out of the question. 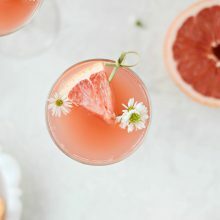 Would skim milk work in this recipe? 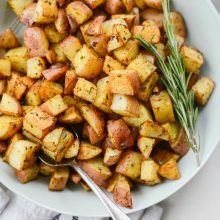 Thanks for your great recipes! Hi Denise! Without testing it’s hard to say for sure, but I think it would be fine. If you try it, I would love to hear about your results! Looks so yumm!!! 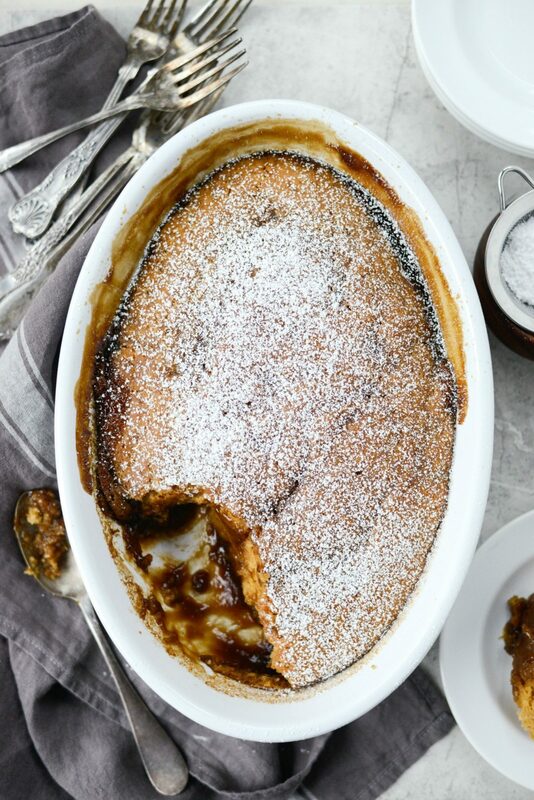 Any ideas on what I could use a substitute for dark brown sugar? It’s pretty hard to find in Romania. Thank you! Hi Irina! I would mix 3/4 of a tablespoon of molasses with the 3/4 cup of granulated sugar in with the hot water. Enjoy! This is delicious. Soft and definitely taste delicious. This goes to my top favorite food by now. ©2019 Simply Scratch. Design by Purr.